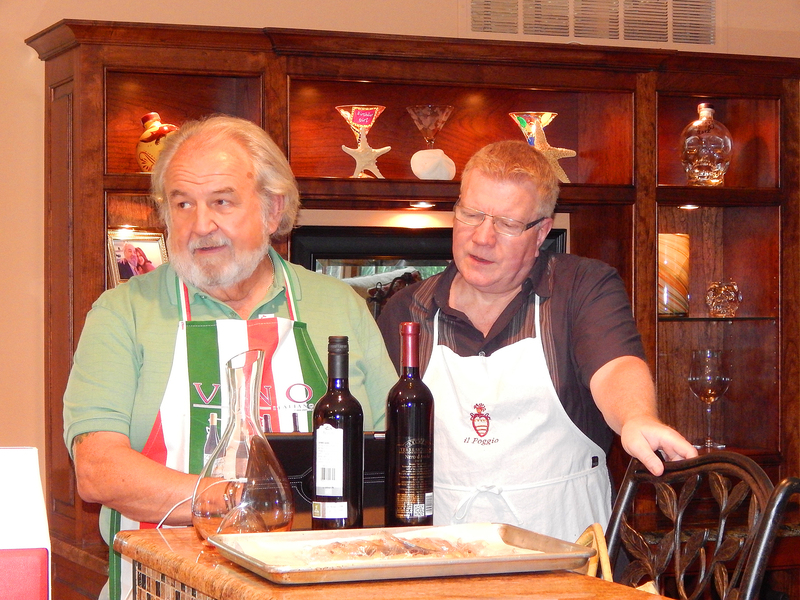 Dave and Russ, smartly dressed in their chef’s aprons, select music on the iPad. Diane and Dave posing in front of one of their back gardens. 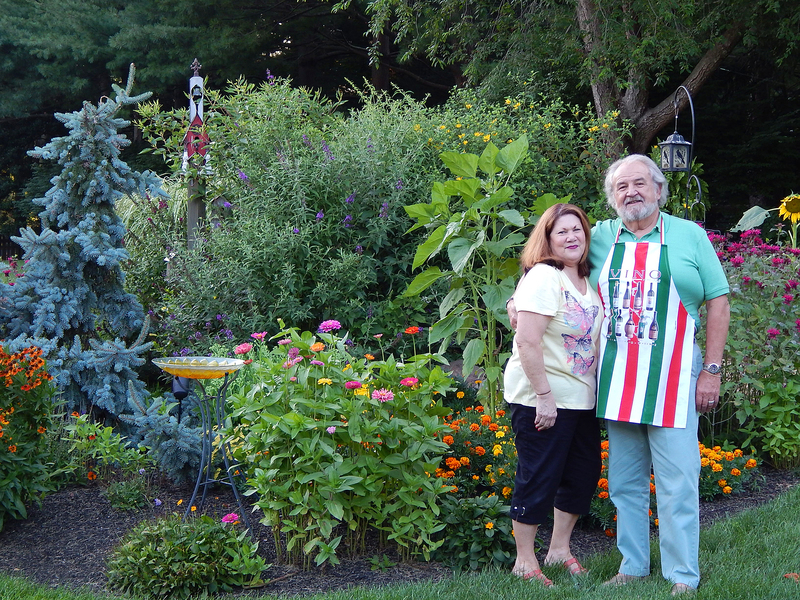 Because of this coincidence and our mutual affinity for cooking and entertaining, we received an invitation to their house to make homemade pasta (Dave took the cooking class with Massimo at Il Poggio, same as us—“Cooking Lesson with Italian Chef Massimo” . After some back-and-forth, we synchronized our calendars for a mutually available Saturday in July at their house in Bryn Mawr. 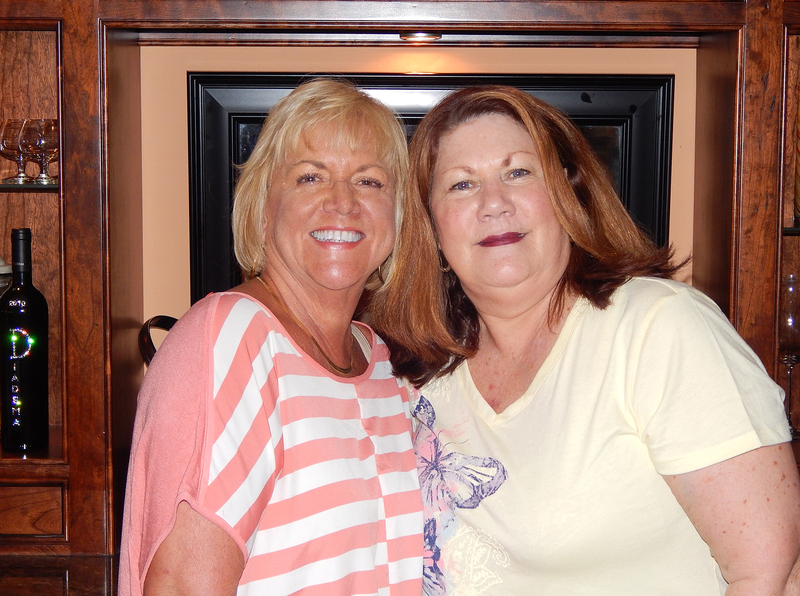 Now mind you, I’d never met either one of them before, but Russ was convinced I’d like them right away. 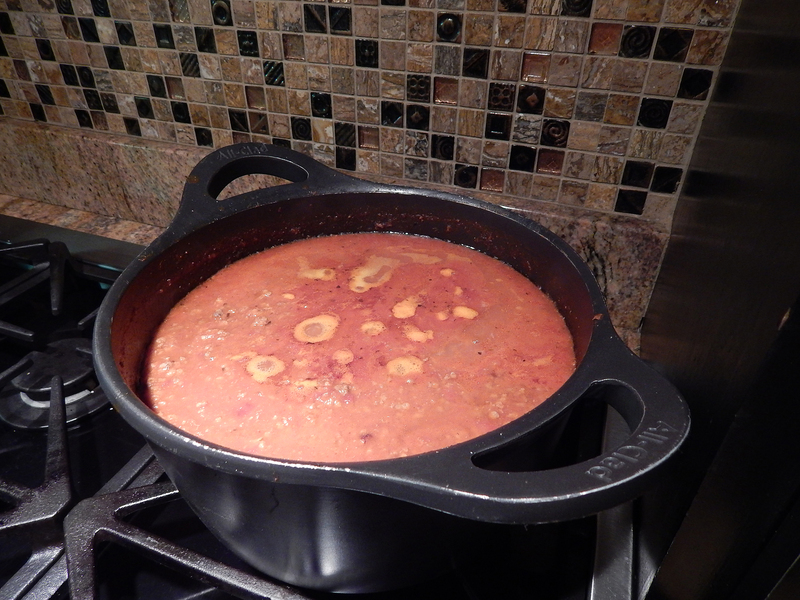 Dave’s homemade bolognese sauce simmered all day. 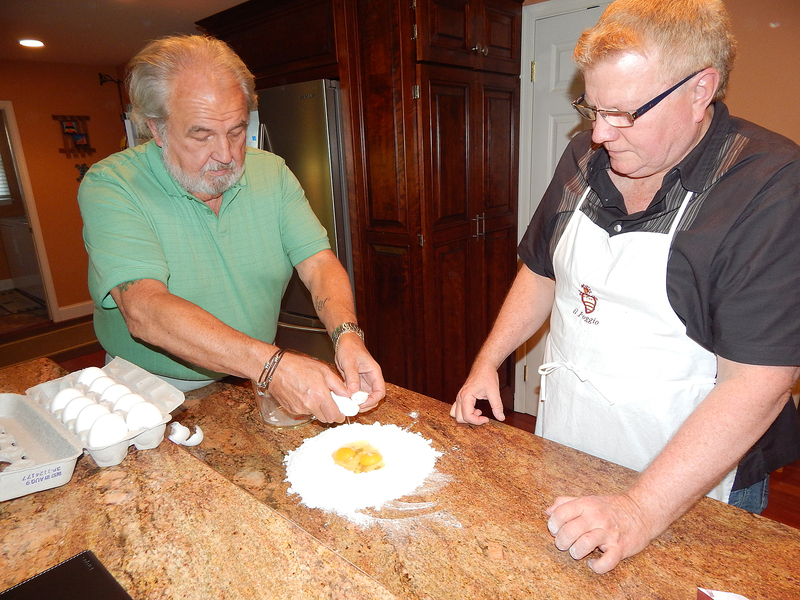 The plan was, Russ and Dave would make a homemade pasta from scratch, Dave would make his famous Bolognese Sauce and trademark Caesar Salad; while we took on the task of providing dessert. Just so happens, about a week before the gathering, we received the Aug/Sept issue of Fine Cooking which featured Amazing Desserts A La Mode. Perfect! 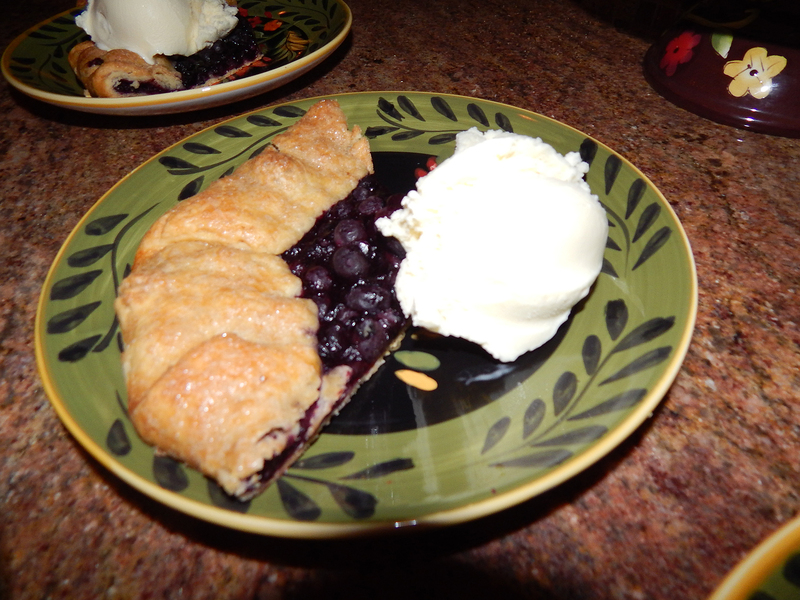 Russ zeroed in on the Blueberry Crostada with Lemon Ice Cream. Another story centered on a glass skull container filled with Crystal Head Vodka and signed by Dan Aykroyd. The vodka is quadruple-distilled and seven times filtered, with the final 3 filtrations through Herkimer diamond crystals—WOWSER! 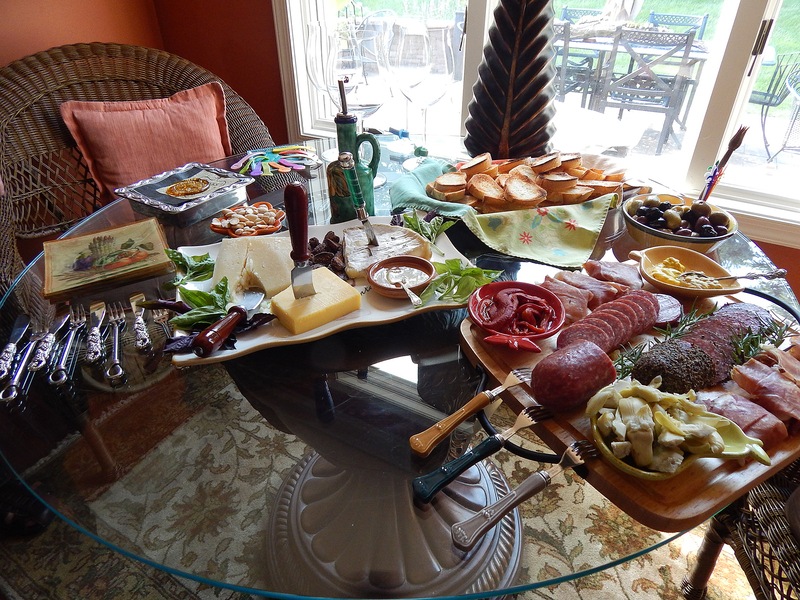 Side table laden with antipasto offerings. 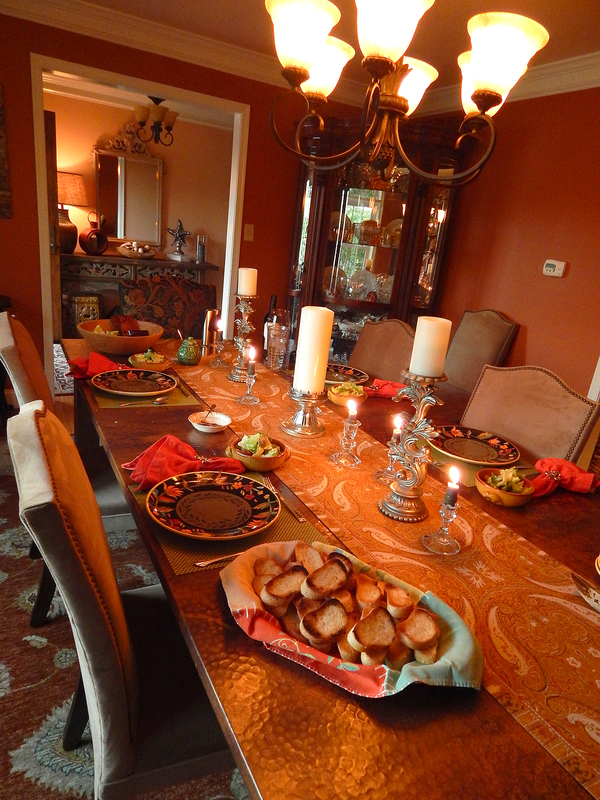 After greetings were exchanged, and with cocktails in hand, we were treated to an amazing antipasto table—not just a platter—that Diane crafted. I honestly thought there must be more company coming given the amount of food! Subsequent to some animated chit-chat indoors, we relocated to their nicely appointed patio out back to enjoy their gardens and some more of the tasty antipasto. 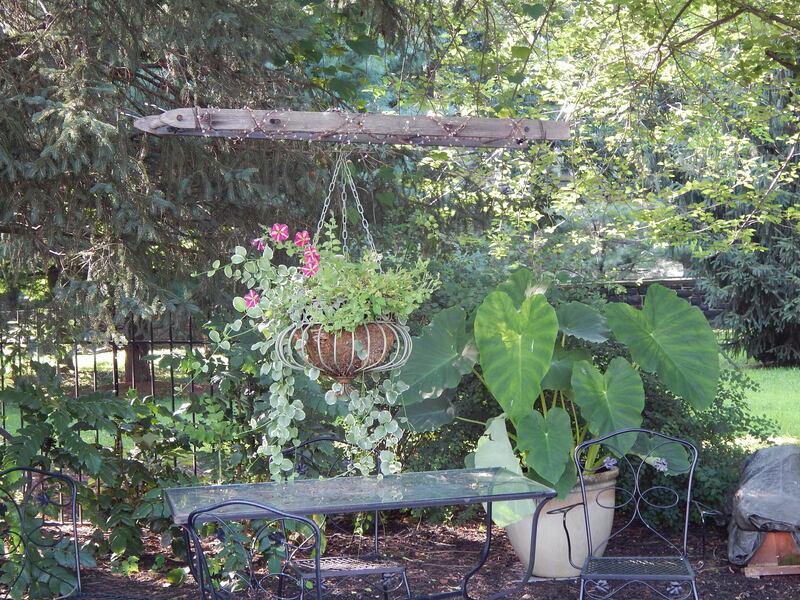 While outside, Diane pointed out an old ladder attached to two trees and strung with battery operated mini-lights with a hanging flower basket centered over a bistro table and chairs—an idea I’m stealing for our backyard. Old ladder strung with lights and hanging basket. 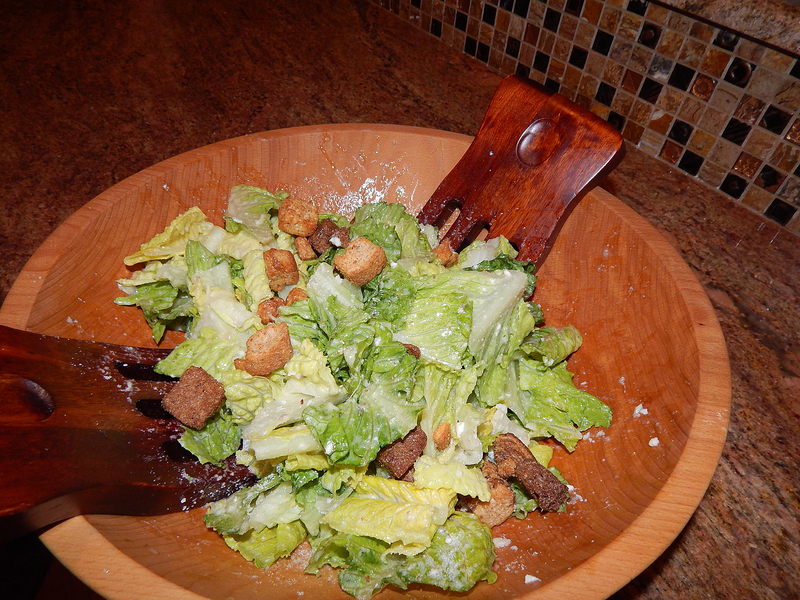 Time to gear up for the main course. 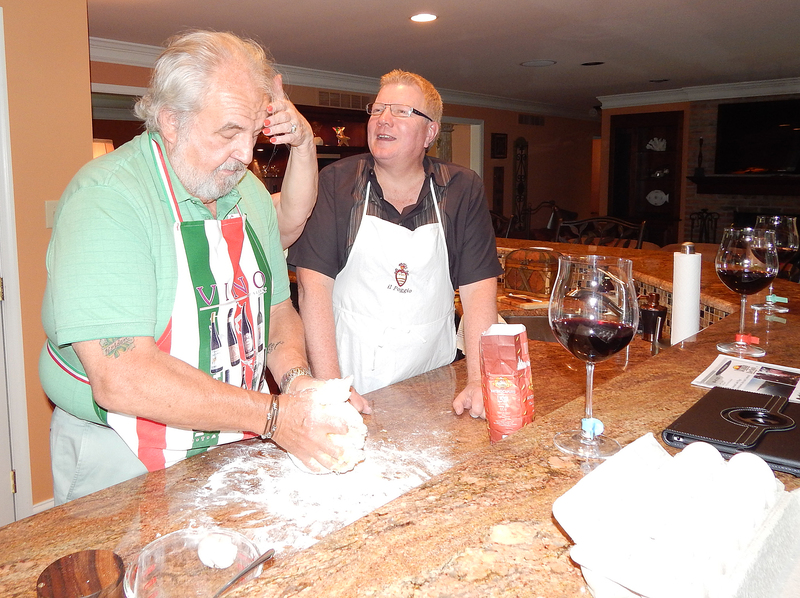 Russ and Dave made the dough from scratch, then wrapped it in plastic to rest for about 20 minutes, while Diane uncorked a bottle of red. 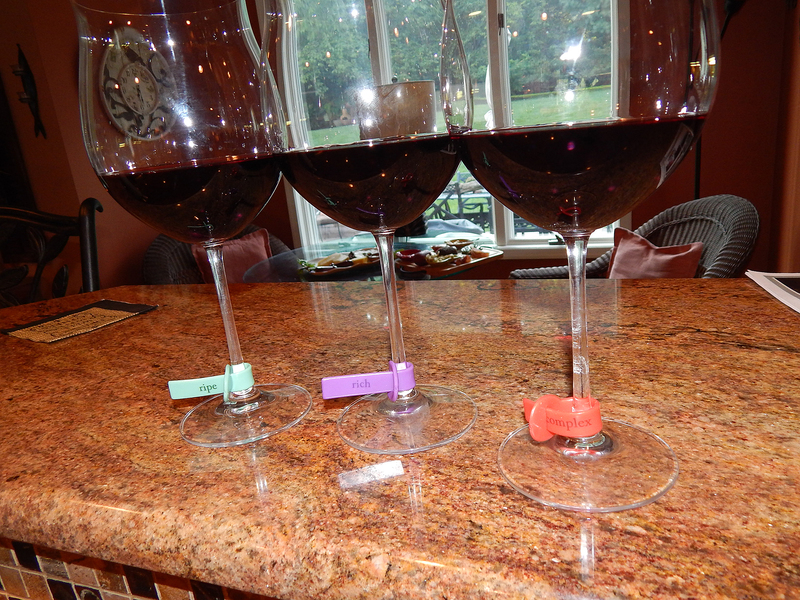 For quick identification we were allowed to choose a wine glass “bracelet” from a selection of various colors and descriptive words. Of course I was immediately drawn to the purple (shocker I know) with the word “RICH” imprinted on it—now that’s inspiration! Russ chose the “COMPLEX”, Diane had the “RIPE” and Dave was “EARTHY.” Whilst sipping wine, we marveled at the myriad of similarities between each couple, with one commonality the fact that we all met via social media dating sites—them on E.Harmony and us on Match.com. Starting to make the pasta dough. 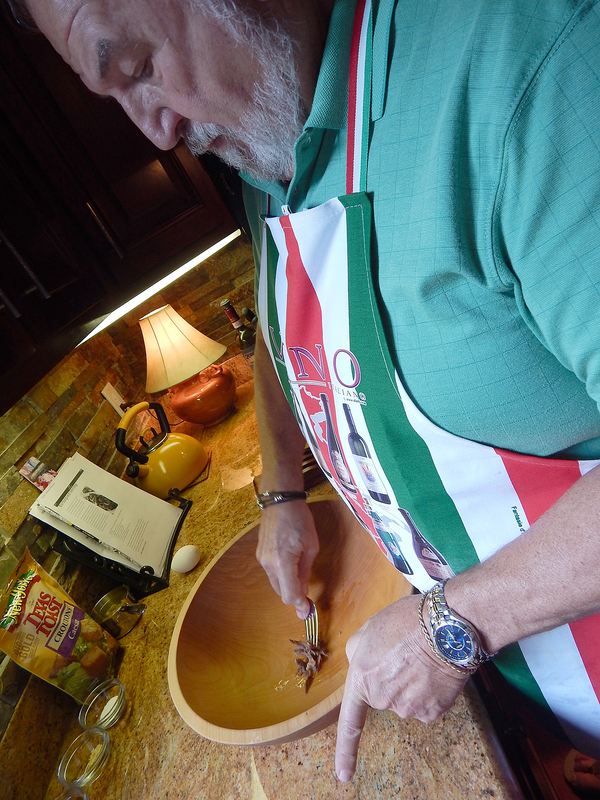 Dave muddling the anchovies for the Caesar salad. 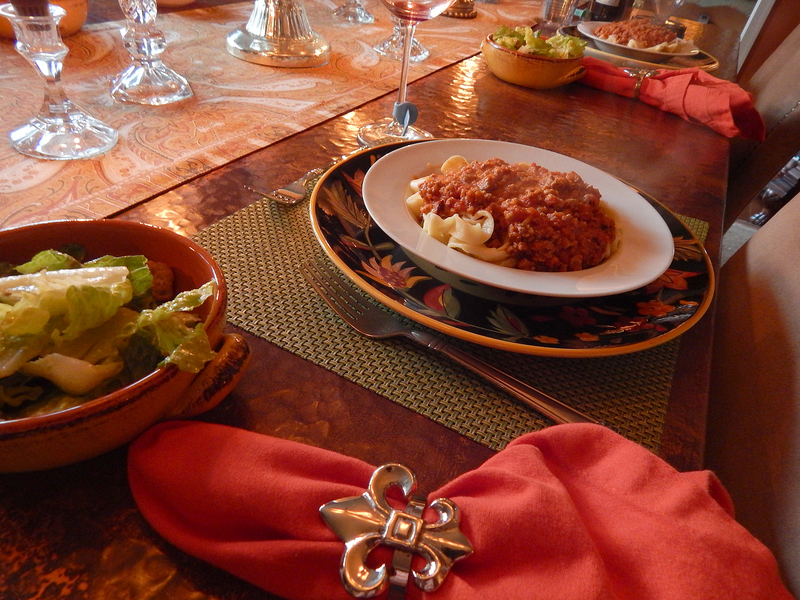 A closeup of the pasta bolognese. 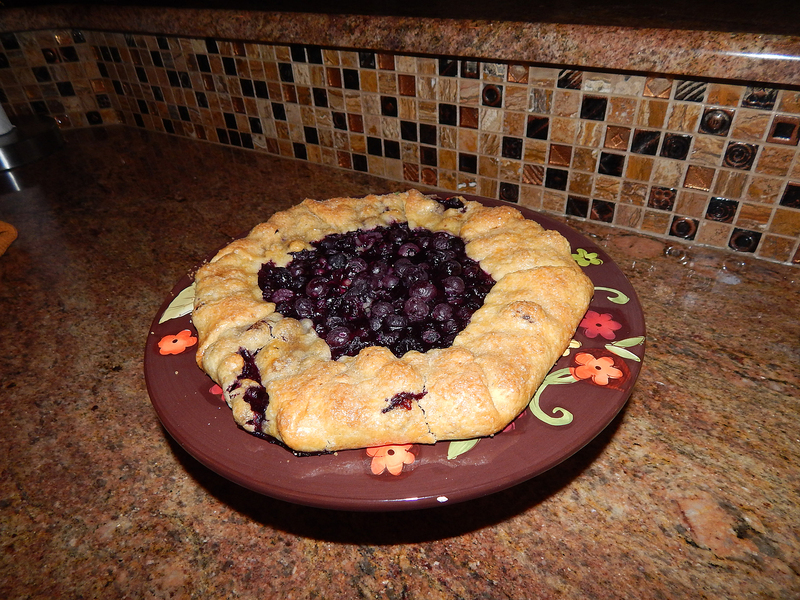 Stay tuned… Recipes for the Blueberry Crostada and Lemon Ice Cream will be posted in an upcoming blog.